or 972-390-1695. If you have airline miles that you would be willing to donate to help the team please let us know. View Photos and Read Testimonies. Every 14 seconds a child is orphaned in Africa due to the HIV/AIDS pandemic. As a result, many orphaned children are raising their brothers and sisters. In response, ZOE Ministry shares the Love of Christ and gives hope to vulnerable children in Zimbabwe, Zambia, Kenya, and Rwanda through the Giving Hope Empowerment Project. This program includes training in farming, animal husbandry, vocational skills, income-generating activities, HIV/AIDS education, health and hygiene. With in 2-3 years, this program frees these orphans from poverty and dependency. The core focus of Giving Hope is to empower orphans and child-led families to become self sufficient so they will not require lifelong assistance from outside relief programs. 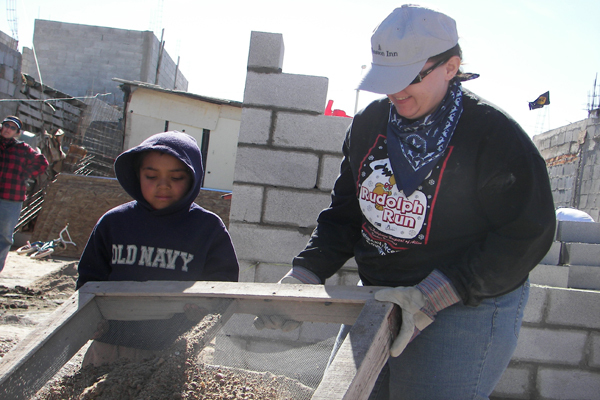 This program centers around Community-Building and Empowering Lives in order to bring the children back into both their local communities and into the loving, nurturing body of Christ. 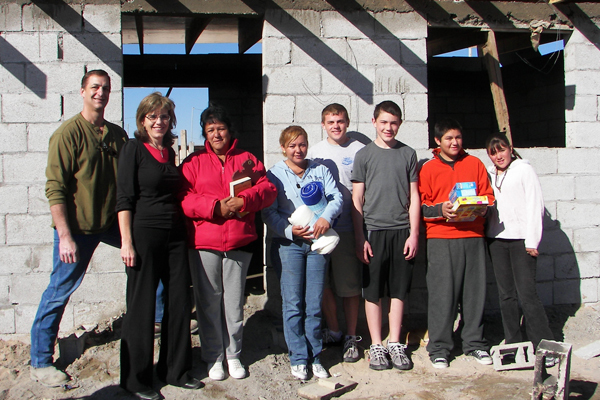 Suncreek United Methodist Church began partnering with the ZOE ministry in July 2010 by sponsoring a working group through the Giving Hope Empowerment Project. 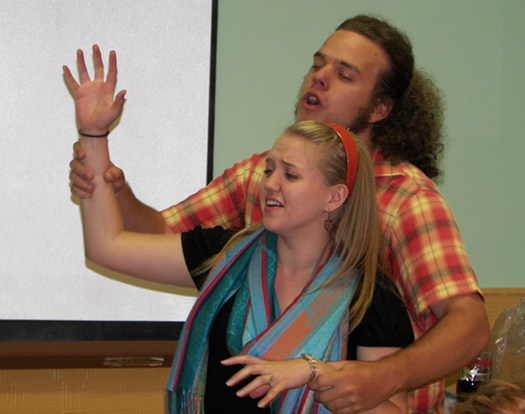 To learn more about ZOE ministry please visit www.zoeministry.org. 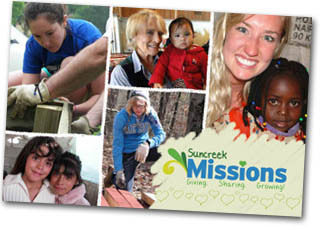 Suncreek UMC designates mission beneficiaries for the monthly communion offering. Persons donate by leaving a gift at the altar rail when they come forward to take communion. Past communion offerings have benefited Florida Hurricane Relief, Dallas Ramps, ZOE Minsitries, English Camp in the Czech Republic and more. Come enjoy delicious refreshments while you begin your Christmas shopping. 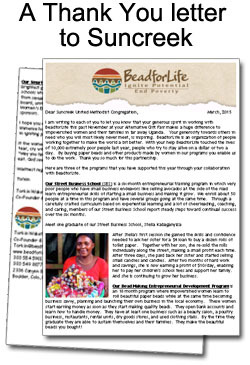 You can choose from Fair Trade crafts or donations that support local, national or global ministries. We provide you with special gift cards for each gift you purchase. Suncreek missions collect used cell phones to help support our American soldiers through the ministry of Cell Phones for Soldiers. Please recycle your cell phones by bringing them to the mission bins located in the church narthex. Cell phones for Soldiers sell your used phones and then use the money to purchase phone cards for our troops. To a military family, a phone call home is priceless. Cell Phones for Soldiers addresses an everyday emotional need that everyone has experienced: the need to call home, to hear a familiar voice while far away. Please help our troops stay connected by donating your used cell phones today. ACO provides a wide range of services to persons in need, including rent, utilities, food and clothing assistance. Trinity River Mission is a community center that works to aid children in reaching their potential through after-school programs, tutoring, and summer activities that encourage high academic achievement. It also seeks to encourage strong and healthy families where children and adults experience love and support. The mission of Collin County Children's Advocacy Center is to identify, protect and improve the lives of abused and neglected children in Collin County. We take bread weekly from Kroger to help the staff. Suncreek also provides homebaked treats to support the staff the first Tuesday of each month. If you would like to be a part of this ministry, please contact Janet Hunt in the church office. A major earthquake hit Port-au-Prince, Haiti on January 12, causing widespread destruction. Millions of people are affected and thousands are feared dead. The United Methodist Committee on Relief (UMCOR) has close ties with the Methodist Church in Haiti and is responding to the devastating earthquake with funding, material resources and prayers. Working with partners, Action by Churches Together, Church World Service, Global Medic and the Methodist Church, UMCOR is channeling its resources to respond effectively to the people most in need.